As a first time mom, I had absolutely no idea what to add to my baby registry nearly 4 years ago before I gave birth to my daughter. One of the most important things a new mother should have is a really good diaper bag. I have gone through two diaper bags. The first one was made of canvas and was a light green color; it got dirty very easily, and one of the cute buttons on the front of it popped right off. The second diaper bag that I purchased was smaller; since I breast-fed, I did not need a very large diaper bag for bottles, formula, or any other related necessities. That diaper bag also got dirty fairly easily, and actually just a week or two ago, one of the straps ripped right out of the seams. If I could do it all over again knowing what I do now, there is only one bag I would want: the Myla bag from JJ Cole Collections. The Myla bag is stylish for trendy moms, and I personally do not think it looks like a diaper bag at all; in fact, I have been using it to carry around more things meant for my personal use rather than my daughter’s. I chose the Myla bag in Midnight Laurel, which is risky because it’s a black and white design. However, it became a non-issue when I opened the package and checked out the material. The exterior fabric is water-resistant, and is called Re-Run; the outer parts of the bag are actually made from plastic bottles. Each bag that is made from Re-Run prevents six plastic bottles from ending up in a landfill. The Myla bag from JJ Cole Collections is a smart, eco-friendly choice for moms that are green. I adore big purses, so the Myla bag is the perfect fit for me. Before I had the Myla bag, I was carrying around both a purse and my daughter’s diaper bag. This got very awkward to juggle, and I had been wishing for something that could contain both of our needs for when on the go. The Myla bag from JJ Cole Collections has a very spacious interior; it is big enough to hold my MacBook Air, the extension cord, my Kindle, several paperbacks (or hardcovers), my wallet, keys, cell phone, and the portable potty, extra change of clothes in case of accident, and toys that my daughter needs when we go somewhere. Even with all of those items packed in the bag, I still have more room left. A new mother will appreciate that the Myla bag comes with a changing pad and stroller grips; though I no longer need a changing pad with my daughter, the stroller grips will come in handy because I do walk about 50% of the places that I go to. I’m absolutely thrilled with the Myla bag; it has a beautiful, trendy design and comes in several appealing color combinations, it’s easy to clean, the shoulder strap is padded and adjustable, and it even has metal balls on the bottom which keeps the bag upright and prevents scratching when it’s set down. Any mother who tries this bag will never go back to her old diaper bag. 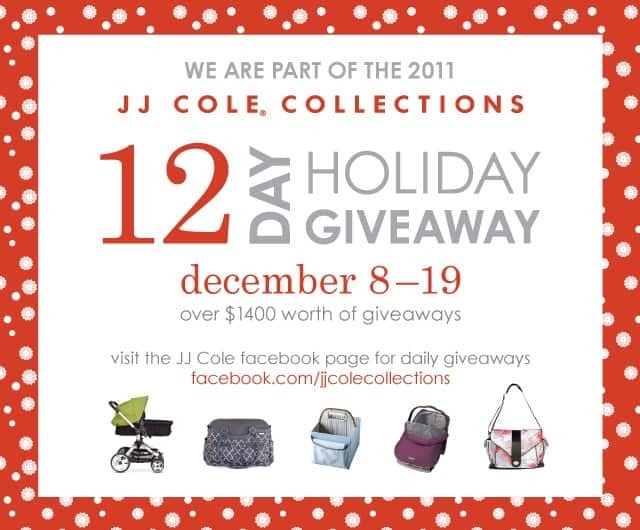 One reader will win the Myla bag from JJ Cole Collection! I love the shopping cart cover – adorable! I like the black magnolia shopping cart cover! I like the Black Magnolia Shopping Cart Cover! Happy holidays! Thanks so much for the fantastic giveaway! I love the mod posy diaper bag! Oh I LOVE this bag! I am a jj Cole junky and have had my eye on this bag since it came out. I like the shopping cart covers! I would love a carseat canopy! I like the car seat arm cushion. I like the Black Magnolia Shopping Cart Cover. I love the blanket! I have three kids so find seat can sometimes be tricky when the park is crowded and I need to keep a close eye on them playing. I love the size and the carrying case! I love JJ Cole products! They have such great style and a variety of patterns. I also love me a big bag!